If I turn my head to the right as I sit at my computer and glance out the window, I see another, more prominent, Emory Roth building: The Eldorado (1931) on Central Park West between 90th & 91st Sts. A Wikipedia article describes Emory Roth (1871-1948) as "a Hungarian-American architect who built many of the definitive New York City hotels and apartment buildings of the 1920s and 30s, incorporating Beaux-Arts and Art Deco details." As of Dec. 2008 Emporis.com lists 89 buildings designed by Emory Roth (all of them in New York City, I think), including 135 W. 36th St. 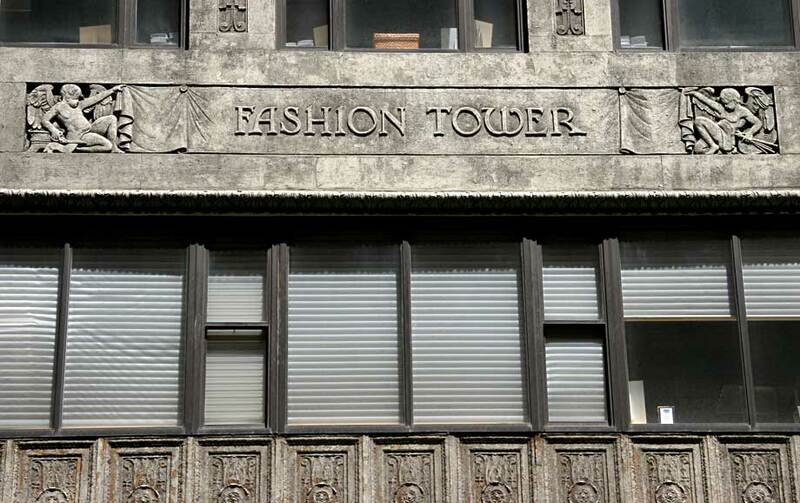 But don't search Google for "Fashion Tower" to find more information about this building. The Fashion Tower name has been co-opted by a pair of buildings at 7th Ave. and 37th St. called South Tower (1925) and North Tower (1930) designed by the architects George and Edward Blum. Diligent searches have turned up no information as to when or why the Fashion Tower moved to its new address. The sign here on 36th St. is big and bold and flanked by angels: one holds scissors to cut the cloth, the other holds paint brushes and an easel, presumably to create the design. But the best part of 135 W. 36th St. is its freight entrance. The building's main entrance has been modernized to boring bland, but the freight entrance has terracotta peacocks! (probably from the original construction) (click for image).